Offering a white label service is one thing, but we've been upgrading our service to offer more than just white label shipping. We brand your parcels too, through your packing slips and now through customisable parcel stickers. 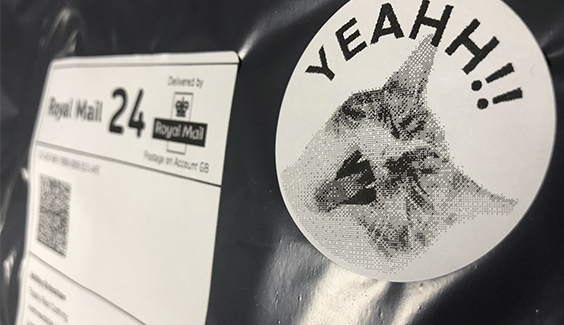 You can upload one sticker per brand, but since it's printed when your order is packed for shipping you can update it at any time. To get started, log in to your account and head to the Brands page. Click to edit your brand profile (or create a new one) and head to the Sticker tab. You can download our sticker PSD template to help you create your sticker here. If you don't use a program that can open Photoshop files you'll need to create a 50mm circular sticker. Please note: currently we print all stickers greyscale, with plans to introduce colour stickers in 2019. Any colour designs will be automatically desaturated by our system. To upload your sticker just click the Upload button and browse for your design! Once uploaded, your sticker is saved to your brand profile and will be printed and applied to your parcels for any order using this brand.